On October 3, 1993, a young Army Ranger was in Somalia as part of the force trying to contain the warlords that were wreaking havoc on the starving people of Mogadishu. The powers-that-be decided to launch a raid to capture the dreaded warlord, Mohammed Adid. The raid was made up of about 120 Rangers and Delta Force Operators. The fire fight had raged for hours. By the time the sun came the next morning, and the smoke cleared, of the 120 Americans in combat, 18 were dead and 73 wounded. Over 2500 Somalis lay dead or wounded. This young Ranger was different from thousands of other troops in Somalia, he was ours!! He was a graduate of Plano Senior High School. Ranger Casey Joyce was killed in action and was decorated with the Bronze Star for Valor for his heroic rescue efforts. He was also awarded the Purple Heart and the Combat Infantry Badge. Casey Joyce was born August 15, 1969 at Fort Rucker, Alabama. He attended the University of Texas at Austin and the University of North Texas at Denton. 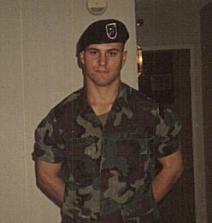 He enlisted in the Army in November 1990, completed Airborne Training and earned the coveted Ranger tab. He served with the B Company, 3rd Battalion, 75th Ranger Regiment at Fort Benning, GA. Sergeant James Casey Joyce is survived by his wife, DeAnna, daughter of Mr. & Mrs. David Gray of Plano; his mother, Gail Joyce, of Granbury, TX; a brother, Steven, of Atlanta, and his wife, Mandy; a sister, Sancy Joyce of Austin. LTC (Ret) Larry Joyce, Casey’s father, passed away in early 1999. Next Next post: What are urgent payday loans?